Choose Smart for intelligent solutions! 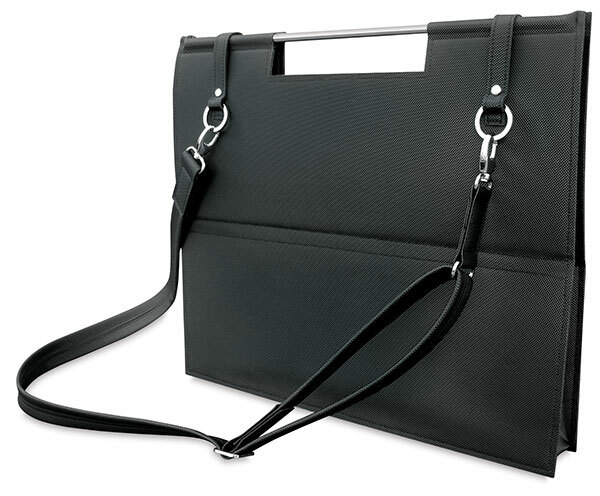 Prat's Smart portfolios are incredibly light, stylish, and portable. Crafted of durable, black PVC, they feature brushed metal handles, chrome fixtures, and removable shoulder straps. They're designed to stand up to everyday wear and tear and retain their good looks over time. Prat Smart portfolios offer a light, stylish solution for making an intelligent presentation. Simply remove the shoulder strap and stand it on a table or floor. The large size accommodates a laptop computer as well as other essentials.